The 20Da was the first, and for many years the only DSLR to be produced with astrophotography in mind. This camera is equipped with a special filter that allows the light from deep red H-alpha objects that other, unmodified DSLRs filter out. Most normal DSLRs can be modified by having the stock IR filters replaced. 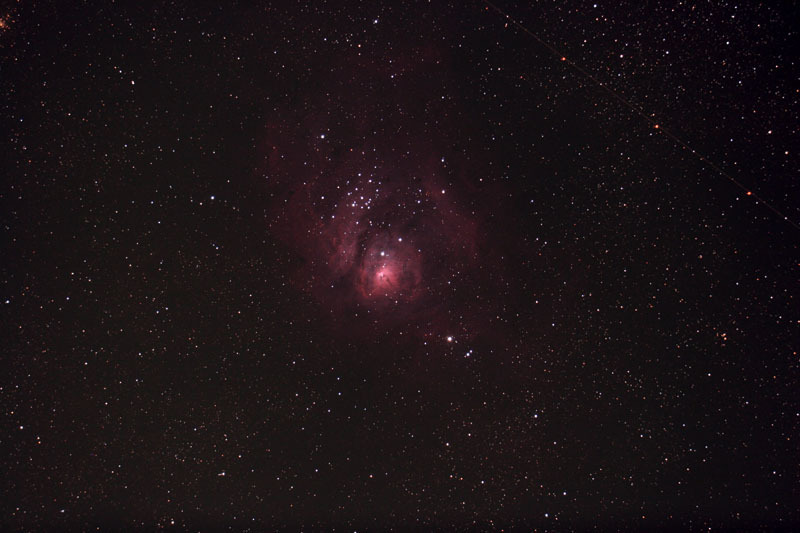 Here's a great link with information about DSLR Camera Modifications for Astrophotography. In April, 2008, I had my 20Da modified by Hap Griffin to get even better H-alpha performance. 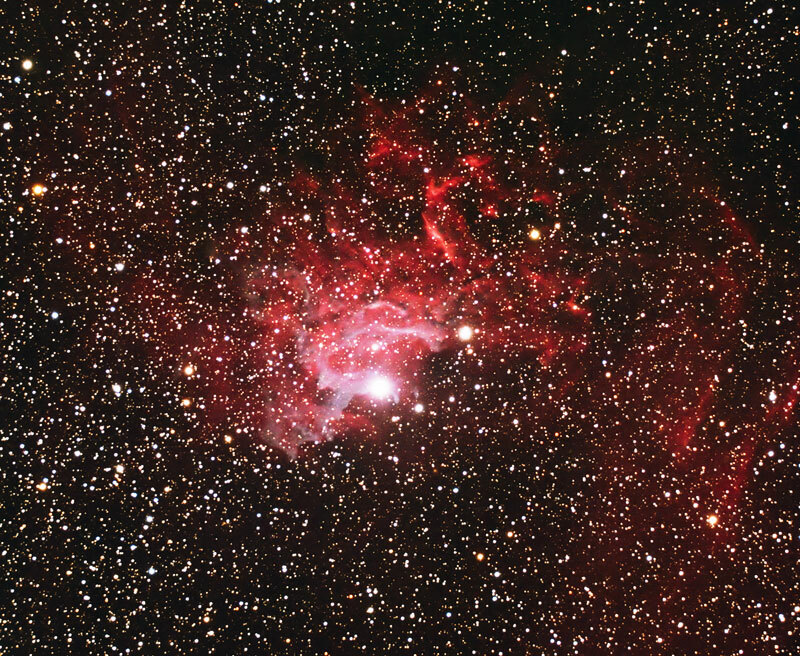 See also my page on Basic Astrophotography and equipment such as my Takahashi TOA 130 Telescope. In late 2008 I began to use a QHY8 CCD Camera, relegating the 20Da to wide field work. 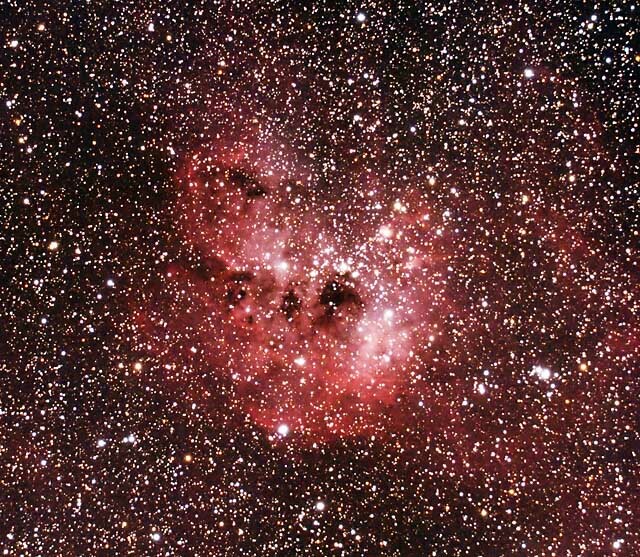 See bottom of page for thoughts on QHY8 CCD vs Canon 20Da DSLR for astrophotography. I am now using a SBIG CCD camera for my serious astrophotography and using the 20Da for widefield work. I was eying a modified Canon 6D as a 20Da replacement as of 8/14. Most photos: Canon EOS 20Da, Takahashi TOA 130 (a 5" APO refractor), Losmandy G-11 mount. This camera has replaced my Nikon D100 for most Astrophotography! Here's my current DSLR Workflow. - Below: Images from NHAC Neal dark sky observing site, 10/22/2005. NHAC Neal Site: 12/28-9/2005 01-02-2006 HAS Colombus: The latest and greatest! 5 minutes, ISO 800, no dark or light frames, no in camera noise reduction, 1200 pixels wide, moderate crop of original. 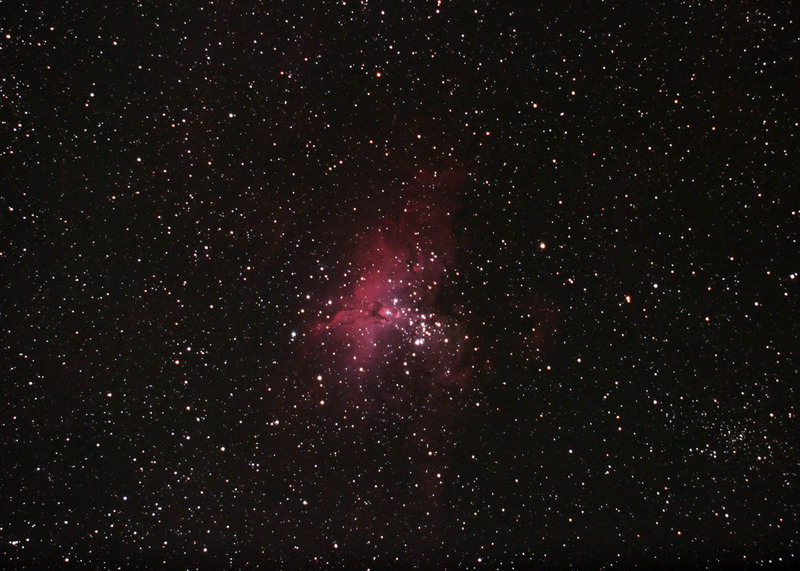 More pix here: M16 Eagle Nebula. This is the object in the famous "Pillars of Creation" shot. 2.5 minutes at ISO 400, full frame, else same as left. Do you see the plane? Needs more exposure, but not bad. Main M8 page. Canon D20a and Nikon D100 noise comparison here. My Current DSLR Workflow here. Stack of 3x6 minute and 3x4 minute images at ISO 800, 800 pixels wide, else same data as left. See the better image image here now. First Light notes: Looks promising! Nice H alpha (the red stuff) response. trip to west Texas, where I had an amazing 7 nights of clear skies. DSLR, and that is a significant advantage over the DSLR. The Canon 20D's 8 megapixel sensor has a 1.6 crop factor and a sensor size of 15X22.5mm. The sensor is about .89 inches wide with resolution of 3504 x 2336 pixels. Dividing the width resolution by the width of the sensor in inches shows us that we have about 3937 ppi on this camera's sensor.